What if you knew the source of stress showing up in your life, why it shows up, and what you can do about it? When a line, or several lines extend across the hand from the inside of the palm just below the start of the Life Line and just above the inset of the Thumb, you’ll find a stress indicator a.k.a. attack line. Severity of stress is determined by a higher quantity of lines, or how deeply they are chiseled. 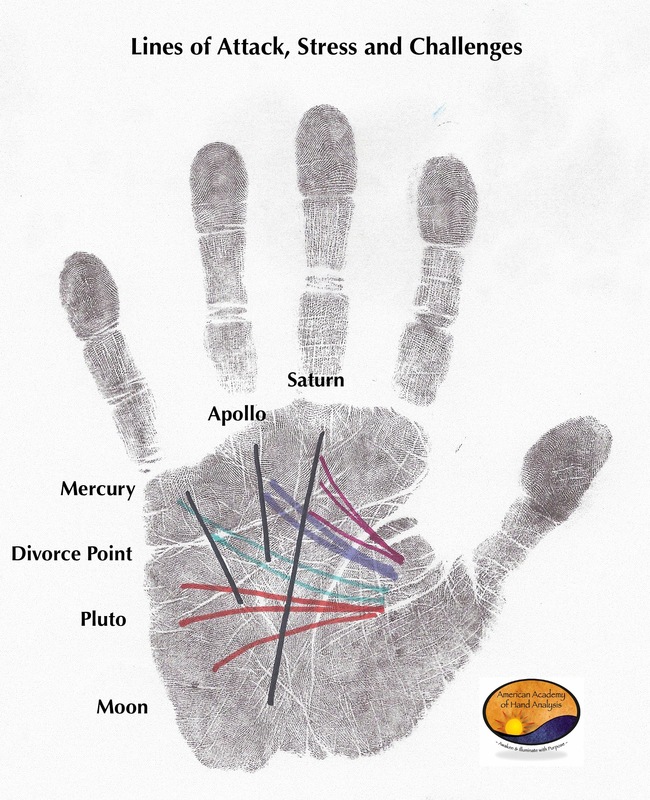 The hand map below shows a variety of pathways the lines can take. Figure 1: The colored lines map a variety of ways attack lines can appear. The etching reflects a repeated pattern of disequilibrium in a particular area of life. These types of lines are common to see in hands. In fact, it is unusual not to find a few of these lines inscribed diagonally across the palm – even in children. Effective ways to overcome the obstacles can be addressed after pinpointing the length and quality of the impression of the line. In essence, the line becomes a rock solid opportunity-indicator for harnessing the undeniable problematic energy it represents. Specifics about the area of stress are deciphered by detecting where the line(s) ends. They have been called attack lines because they originate in the area of the palm called Mars. To better understand these stress indicators let’s consider the Roman mythological archetype, Mars. He is known as the god of war always wearing a shield of armor; built to do battle in an instant. When Mars has a particular cause he stands tall, can become aggressive and even rageful. Women like Joan of Arc and Wonder Woman personify this archetype, too. For example, if you see an attack line stretching across your palm and it ends under your ring finger then you might feel a looming sense of fear of rejection related to something you have created or want to create. For example, putting yourself out there to make a spaghetti dinner for visiting friends can make you a nervous wreck over the quantity of each ingredient to combine so that it looks and tastes just right. When this fear is present then the, “I’m just sure I’m going to be criticized” radar is triggered. Not receiving applause for the dinner can even feel like an attack. This in turn could launch an immediate defense such as, “I know, if I would have used farm raised ground beef instead, this would be much better.” Keep in mind; none of the guests have yet said a word about the spaghetti dinner! In this example, the owner can feel an inherent disapproval of his or her individualistic nature. Here is a bellowing call for courage! With the attack line ending under the ring finger, there is a call to feel the fear of the tomato and make the spaghetti anyway. It’s helpful to consider the worst-case scenarios but not to dwell on them, but instead to give them airtime and turn the obstacle into an opportunity for growth. The most important point is to reject the tomato fear and find a way into to your heart-felt creations. Lines of Courage is another phrase I use for attack lines because there is a call for a change to balance the disequilibrium and change frequently requires courage to do something differently. Courage lines present an opportunity to discover and understand the source of conflict so that it can be harnessed for building a better life. But that takes bravery. The example of making the spaghetti dinner and presenting it to the guests even with paralyzing fear of rejection, takes a heavy dose of daring to put ones self at stake. By knowing more about the meaning associated with the various end points of the lines in the hands we better understand the warnings, the positive and negative possibilities, and precisely how to use the God-given-glyph to cultivate a plan for growth. Attack Lines Negative: My defenses are triggered [in this particular area where the line ends on the palm] and I become aggressive (or passive aggressive) against others and myself. Mantra: I observe stress and conflict in particular areas and I stand strong in my courage for what is important to me. I harness this energy effectively for the greatest good of all concerned. Join Kay for her webinar-workshop teaching about Challenge Markings in the Hands and How to Create and Uplifting and Inspiring Message.